Located in Mena, Arkansas, Ace Realty has many different types of farms for sale throughout Arkansas, Oklahoma, and Missouri. We have the experience and ability to walk you through each step from purchase to closing. With friendly, honest, and professional agents, we are available to assist you with every aspect of purchasing a poultry farm. Financing always varies from one buyer to another. As all buyers are different, so are all farms. Thus, we have to look at the 'whole picture' to know what it will take to make you happy and successful. We are familiar with the 'ins and outs' to help you secure suitable financing. We will accompany you to any meeting you might have with bankers or poultry companies. 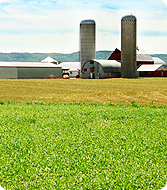 Locating and purchasing a suitable farm that fits your family's needs is not necessarily a simple process. A farm has to be able to produce a positive cash flow to supply enough income for your individual family's financial situation. The amount of down payment you provide (usually 15 to 20 percent) directly influences the amount of cash flow on a farm. Broiler Farm is a farm that is involved in the production of poultry for meat. Baby chickens are delivered to the farm at one day of age and are generally kept from 5 to 9 weeks. After this time the broilers are removed from the farm to harvest for meat. The "out time" is usually 10 to 14 days. Pay on broilers is on a pound of meat-produced basis and has many variances for the pay formula. This poultry operation is primarily involved in hatching egg production. Generally, a farm will receive pullets (young hens) when the pullets are approximately 20 to 22 weeks old. These hens will remain on the farm and in egg production for approximately 43 to 46 continuous weeks, at the end of which, they will be picked up and taken to slaughter. The typical 'out time' is four to six weeks. Pay for breeder hens is generally on a 'per dozen eggs' basis, often with other bonuses possible. This poultry operation produces young hens for the breeder hen operation. A farm will receive baby female chickens. These chickens are raised continuously for approximately 20 to 22 weeks, until then they are picked up and taken to a breeder hen farm. The farm will typically have "out-time" of 10 to 14 days for maintenance or cleanout. 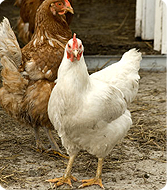 Pay on a pullet farm is usually done on a square foot basis. Contact us for more information on our Chicken & Poultry sales.